A nurse taking care of an infant child in an incubator at the Al-Sabeen Hospital in Sana’a. Hospitals and clinics in Yemen have been paralyzed by the war: they have either been attacked, run out of medical supplies and fuel or the medical staff have been forced to flee. With increasing wartime assaults on and patterns of systematic destruction of health facilities in countries affected by conflict, the United Nations Security Council unanimously adopted a resolution today to strengthen protection for health care workers, the sick and wounded, hospitals and clinics, in war zones. Speaking to the 15-member body, Secretary-General Ban Ki-moon reiterated that denying people access to essential health care is a serious violation of international humanitarian law. “All too often, attacks on health facilities and medical workers are not just isolated or incidental battlefield fallout, but rather the intended objective of the combatants. This is shameful and inexcusable,” Mr. Ban told Council members. In Syria and elsewhere, he noted that Governments impose “cumbersome procedures” that restrict access to healthcare: “This is strangulation by red tape. It is violence by bureaucratic means rather than force of arms, but it is just as devastating,” he said. “Through their leaders here today, I want to thank and commend all of their personnel for their professionalism and dedication in serving people in danger and distress across the world,” he said, recalling that last week, MSF’s head of mission in war-ravaged Aleppo had underscored the urgency and importance of efforts such as today’s resolution. Aleppo was recently hit by an air strike, which Mr. Ban said was “by all accounts by the Government of Syria.” It destroyed a hospital and killed at least 20 people, including three children and the area’s one and only paediatrician, Dr. Mohammad Wassim Maaz. He added that a similar pattern of systematic destruction of health facilities is evident in Yemen, with more than 600 medical facilities having closed because of damage sustained in the conflict and shortages of supplies and medical workers. “Attacking a hospital, threatening a doctor, coercing a nurse to give preferential treatment to armed fighters, hijacking ambulances, using patients as human shields – these are not collateral damage. These are not sad realities we have to get used to. They are abominations to fight and trends to roll back,” he said. “This resolution marks a momentous step in the international community's efforts to draw attention to a problem that we otherwise risk getting used to through the sheer frequency of its occurrence,” he added. Meanwhile, MSF’s Joanne Liu told Council members that while the nature of warfare may have changed, the rules of war have not. “You are charged with protecting peace and security. Yet four of the five permanent members of this Council have to varying degrees, been associated with coalitions responsible for attacks on health structures over the last year. These include the NATO-led coalition in Afghanistan, the Saudi-led coalition in Yemen, the Russia-backed, Syrian-led coalition. You therefore must live up to your extraordinary responsibilities, and set an example for all States,” she stated. “This resolution must lead to all states and non-state actors stopping the carnage. You must also pressure your allies to end attacks on healthcare and populations in conflict areas. We will not leave patients behind. And we will not be silent. Seeking or providing healthcare must not be a death sentence. You will be judged not on your words today, but on your actions. Your work has only begun. Make this resolution save lives,” she concluded. In his address, the Secretary-General also reiterated that the World Humanitarian Summit, a two-day conference in Istanbul beginning on 23 May, is the moment to renew commitments to preventing and ending crisis, and that the engagement of all partners – Governments and NGOs – is necessary. “The success of the World Humanitarian Summit is in your hands,” he stressed. 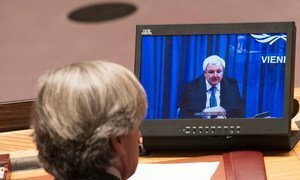 With hundreds of thousands of civilians killed, millions of people displaced and countless families torn apart, the UN relief chief today described the human toll and suffering in Syria as “sickening,” and said the global community should be “ashamed” that this is happening on its watch.